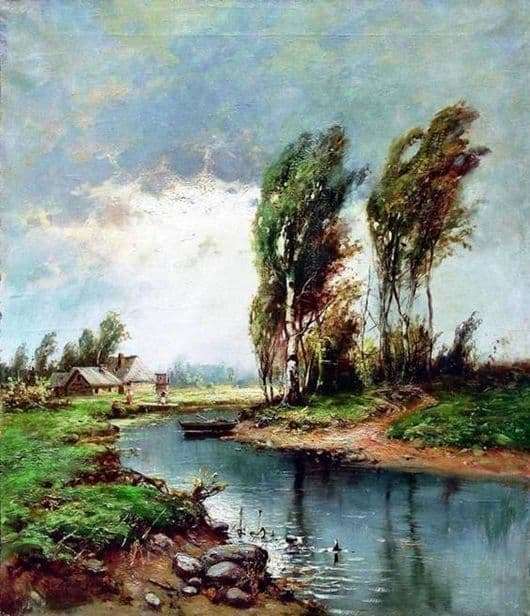 Klever Yuly Yulievich – Russian artist who specialized in landscapes. Born in Estonia. He graduated from the Academy of Arts in St. Petersburg, became an academician, and later – a professor. In the works of the artist pronounced lighting effects. The artist fell into stereotype, often depicting the same types and scenes. His art acquired salon-academic character. As it was customary to think in those days, the only possible school of landscape painting was Italian. That is why, at the Academy of Arts, during its formation, learning the art of landscape was reduced to the development of the Italian school of landscape painting. “Italian landscape” as the term meant a beautiful image of the area. Yuli Yulievich Klever did an excellent job with the beautifulness of the performance and not the catchiness of the content – these are the main features that are distinctive for the Italian landscape. Artwork Klever began in 1868 with a copy of the picture of Achenbach. in 1874, the first exhibition of the artist, which was crowned with success. The work of Yuli Yulievich developed quickly and rapidly and reached the point where Alexander III, one of his paintings (“Birch Forest”), acquired, reigning at that time. After that, the artist literally bathed in glory. Art Clover loved and revered. At that time, it was considered notorious not to have a picture of the author’s work. Due to his success, Clover did not need his work exactly and did not seek it. He paid much more attention to the expressiveness of the picture as a whole. In all the works of the artist can see the sharpness and brightness of the seasons and weather. This is especially evident in the painting “It will rain”: the bright spot highlights the sky before a thunderstorm and its reflection in the water. Nature is depicted so clearly that it makes at first sight fall in love with the north of the fatherland.